Are you going on holiday to Thailand? Theres more to the land of smiles than sunny beaches and shopping. Why not check out some of Thailand’s fascinating archeology? Thailand is a country steeped in history which goes back thousands of years. Throughout Thailand there are various sites of archeological interest; however probably the best and most interesting archeological sites in Thailand are ancient cities once playing host to the royal courts of ancient Thai kingdoms. Here we introduce you to two of the most famous archeological sites in Thailand today. Sukhothai historical park, which is situated in central Thailand is perhaps the most well known and important of Thailand’s archeological sites. 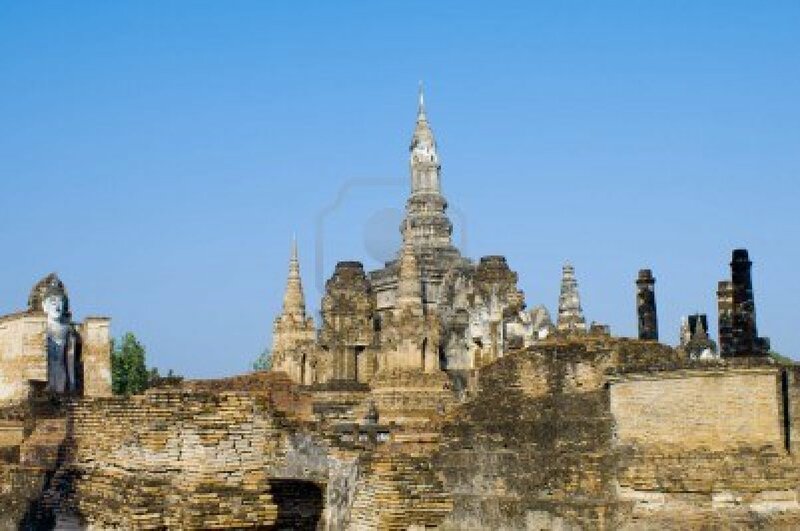 Established as a city in the 13th century, Sukhothai can be considered to be the first capital of a unified Thailand. The site is quite vast and a full day can easily be spent touring the many highlights which include the remains of the royal court, several temples as well as other monuments of interest. There are plenty of small hotels in the vicinity should you wish to spend the night and bicycles can be rented to tour the archeological site with. Investing in a map for a couple of dollars is probably a good idea as it gives you the freedom to decide on which parts of Sukhothai historical park you really want to see. Ayuthaya used to be the capital of Siam before Bangkok became the modern day capital of Thailand. As recently as the 18th century Ayuthaya was a sprawling and sophisticated city with civil administration and infrastructure. The decline of Ayuthaya came about, however, in 1756 when the Burmese army invaded and sacked the city after which point it was abandoned. Because of its relatively young age for an archeological site, Ayuthaya is well preserved and can easily be visited on a day trip from Bangkok. Among the highlights of a visit to this Thai archeological site are the rows of dozens of headless meditating Buddha statues carved from stone. A free resource page offering news, articles, information and facts about the country Thailand.